Roku is rolling out the latest generation of media streaming boxes later this month, with a new, smaller form factor and more powerful graphics at the same price point as the last generation. With the release, the company is betting big on casual games becoming available on new Roku 2 devices, including Rovio’s Angry Birds. Like its product release last year, the new generation of Roku boxes will have three distinct price points with products targeted at entry-level, intermediate and power users. The Roku 2 HD ($60), Roku 2 XD ($80) and Roku 2 XS ($100) will soon be available online and in channel partners’ retail stores in the coming weeks. Tech specs for all three are as expected after Roku’s next generation of devices leaked online due to an FCC filing, but this release isn’t about the technology under the hood as it is about the new opportunity it introduces through casual games that will soon be released on the platform. While Roku is continuing its practice of having different price points for different users, most of the innovation and value comes at the high end. 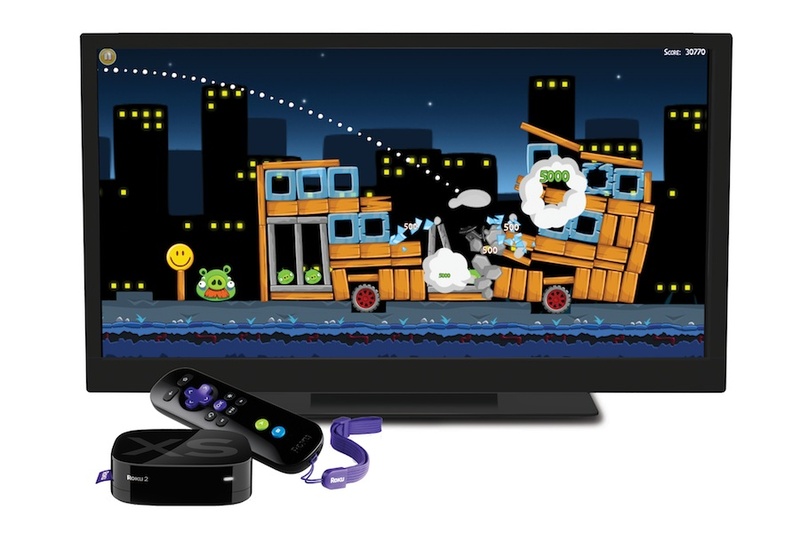 The startup has not only packaged Angry Birds with the Roku 2 XS, but it’s also included a game-changing remote control (no pun intended) with an accelerometer included. While only the top-of-the-line model comes with the new gaming remote, it will be available as a separate accessory for Roku users that want to buy it later. That remote is what mostly makes Angry Birds playable on the device. It’s powered by Bluetooth, and it’s capable of working with all three models. Also contributing is a new processor built into Roku boxes that will enable the kind of casual games that will soon become a staple on the device. In addition to the original Angry Birds title, Roku will soon release Angry Birds Seasons and Angry Birds Rio. But that’s just the start of its casual games revolution: Roku has also struck a deal with Namco that will bring Pac-Man CE and Galaga to the platform, and has other similar deals in the works, according to Roku VP of Marketing Chuck Seiber. The new devices aren’t just about gaming, though. New video and social networking applications are being released with the platform as well. That includes a new, just-released Facebook channel with higher-quality picture and video capabilities, as well as channels for Epix, Major League Soccer, AOL (s AOL) and FOX News (s NWS). I hear Rovio will be launching Angry Birds 3D later this year as well,and Console games for Playstation and PSP are in the pipeline.Anyway,I have never heard of Roku,is this another gaming platform or what? That’s nice to see that Angry Birds is adding another platform in its portfolio. Unfortunately, the controller for Roku is a point and click type which is a little old for me. I still prefer Kinect style sensor. Why would Roku release a new remote control and not improve the search capability?? (ala Boxee keyboard on remote, or Wii style point-n-click)?? I love my Roku box, but the archaic scroll-thru-the-alphabet-to-spell-keywords is a tremendous fail for ease-to-use. I gave my old Roku box to my parents, and was really disappointed that you have to submit a credit card number to set them up; there’s not an easy way to bypass this without contacting them.